Last month (before festival madness began) I was invited down to Edinburgh's Hard Rock Cafe to try out their new and improved Legendary Burger menu. Whenever I think of Hard Rock I always remember being on holiday in Orlando, and thinking it was the absolute COOLEST restaurant in the world (I was 10, and was easily impressed by guitars and loud music). 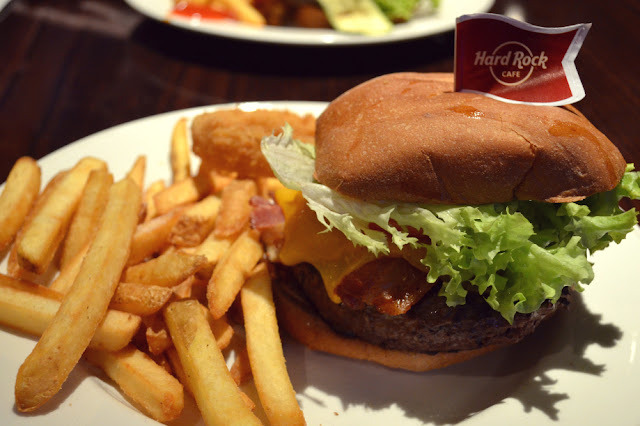 Each Hard Rock cafe has a local option on the Legendary Burger menu, and Edinburgh's is (unsurprisingly) a Haggis burger, which comes with mull cheddar cheese, whisky maple mustard glaze and deep fried turnips. Now, I do heart haggis (have you tried it? It's amaaaazing!) but I am not yet convinced that it belongs on a burger, so instead I went for a classic - the Legendary 10oz. burger. This came with bacon, cheese, a crisp fried onion ring, lettuce, tomato and pickles. Proper hearty, American burger ingredients! Craig (being vegetarian) picked the Veggie Leggie - a grilled soy patty topped with a portobello mushroom, zucchini, yellow squash and roasted red pepper. Most restaurants (especially big chains) tend to be very lazy with looking after vegetarians, so we were both SO PLEASED with how lovely and helpful the HRC server was! When he ordered the server pointed out that the veggie burger used a meat-like equivalent (which he really liked, but appreciated the warning), and also offered to go through the menu with him and tell him what meat dishes could be turned into Craig-friendly ones. 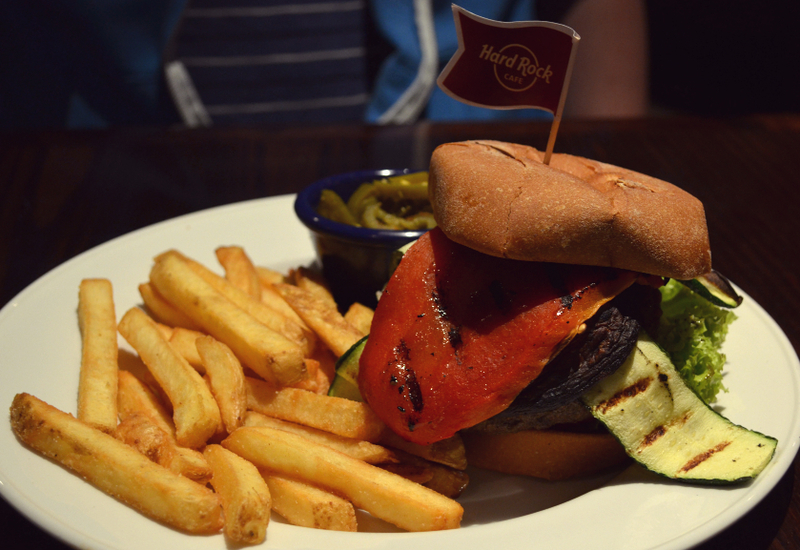 I always feel a bit guilty going out for dinner to somewhere that only has one or two veggie choices on the menu, so this was ace customer service, cheers Hard Rock! Both burgers were super tasty and passed the soggy bun test (I HATE when burger rolls fall apart half way through!). It's obviously not the healthiest meal to have, but when you are in the mood for some dineresque food you really can't go wrong with Hard Rock. ah this looks so yum! Mmmmmmm burgers are my weakness! Might take a train to Edinburgh soon and visit there! Hard Rock always reminds me of Orlando too! 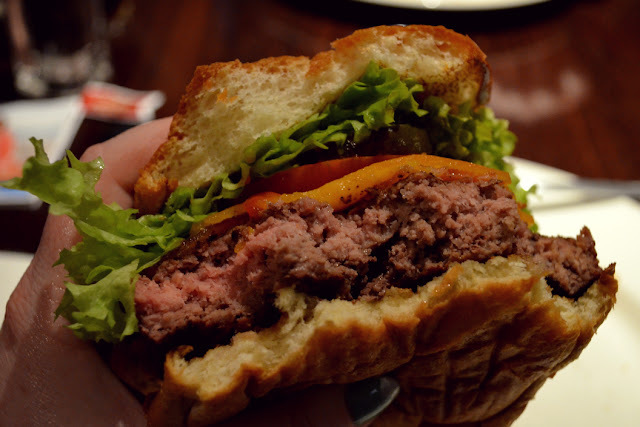 I haven't been for food in a while either, but I'm obsessed with their Frozen Strawberry Daiquiris and this Burger looks amazing so I might have to make a visit!